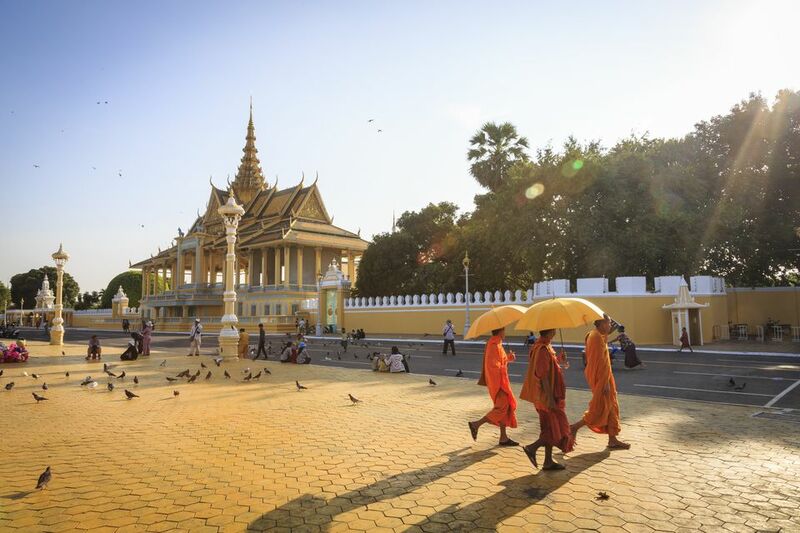 While it lacks the cachet of high-flying regional metropolises like Bangkok and Singapore, Phnom Penh in Cambodia offers a more down-to-earth charm in return. The city's slower pace and more human scale show travelers a different side of the Southeast Asia urban experience. We asked two expatriates living in Phnom Penh — Anne-Marie Andrada, an advertising creative director; and Jennifer Ryder Joslin, teacher and one half of the travel blog Two Can Travel — about their top recommendations for first-time travelers to the Cambodian capital: the places that they take their own close friends and family when they visit. Use their tips to find your own way around this picturesque metropolis when you next drop by! Shopping malls may be taking over Phnom Penh, but both locals and tourists know to find real deals in one of Phnom Penh's traditional markets. Built between 1935 and 1937, Phsar Thmei, or Central Market (location on Google Maps) was designed in a distinctive Art Deco fusion style by French architects; its dome alone makes this a must-visit for first-time travelers to Phnom Penh. Shoppers can get some of the city's best deals for precious stones, metals and jewelry in and around Central Market — beyond the stalls in the Market's interior, shoppers can cross over to the gold shops on the other side of the road, too. This former school found itself in a very, very dark place in the 1970s — as the Khmer Rouge took over Cambodia, its fanatical leader Pol Pot instituted a “Year Zero” that deemed intellectuals, noblemen, and city dwellers as worthy only of death. Torture camps like S-21, or Tuol Sleng (location on Google Maps), contributed to a genocide that eventually killed up to three million people. Four buildings stand around an open courtyard, their grisly contents attesting to the gory and utterly needless suffering that the Khmer Rouge inflicted on innocents for four long years. A macabre photo gallery of victims stares blankly out at visitors in Building B; all-but-empty rooms and starkly lit interiors allow travelers' imaginations to run wild at the horrors that must have happened here. “It is such an intense experience — one you will be glad you had to better understand Cambodia and what people and their families have been through,” said Joslin. Only the Palace's south and central compounds remain open to visitors; the Khemarin Palace in the northern compound, where the King still lives, is off limits. Popular stops in the Palace grounds include the Silver Pagoda, whose interiors house a series of Buddha statues encrusted in precious metals and gems, most notably the life-size Maitreya Buddha studded with over 9,000 diamonds; and the Moonlight Pavilion, a venue for traditional dance set alongside the Palace walls. The locals know it as Phsar Toul Tumpong, but visitors know the Russian Market by reputation as one of Cambodia's best places to visit for cheap branded goods. The promenade on the western quay of the Tonle Sap and Mekong Rivers attracts plenty of local color, with the possibility of a snack or ice-cold-drink break at one of the many restaurants along Sisowath Quay. Still, you'll get no better view of the river than the one from a cruise boat. Local boat operators all along the riverfront offer cruises for between $15 and $25 per person. Departing in the late afternoon, you'll sail past traditional fishing villages and the graceful Phnom Penh skyline before turning your attention to the gorgeous sun setting over the Mekong. While you're hanging around the riverside, why not take a few minutes to visit the oldest part of Phnom Penh? Wat Phnom dates back to the 14th century, when a devout widow known as Grandmother Penh found four bronze statues of the Buddha embedded in a tree trunk floating in the river. The wealthy widow built a shrine for the statues in an artificial hill; the city Phnom Penh later grew around the hill and shrine. The sacred stupas and monuments around the Wat Phnom grounds combine memorials to long-dead kings and depictions of a variety of guardian spirits covering Hindu, Buddhist and Confucian beliefs. Grandmother Penh herself watches over the goings-on from a small pavilion sheltering her statue. As you walk from the entrance of the complex up to the summit of the hill, you'll be accosted by beggars, drink sellers and bird vendors (freeing birds from their cages represents a merit-making activity in local Buddhist lore). The hubbub on any given day pales in comparison with the merry-making chaos that descends upon Wat Phnom during the Khmer New Year and other major Cambodian festivals. This alley off Street 308 has blossomed into Phnom Penh's most popular food and drink drag: pick one place to start with and make the rounds of this hidden bar street. "Every bar’s got a different vibe, but I’m a bit biased towards Hangar 44 for the gin and tonic,” said Andrada. “I’ve never been a G&T kind of girl until I met this G&T." Cocktail lovers should also try the Asian Infusion from Meat and Drink. For good chow to go with your drinks, Andrada recommends the ramen and gyoza over at Masamune and the burgers and chips from Meat and Drink. “You can even ask the great staff over at Piccola on Street 308 to deliver pizza to wherever you are in Bassac Lane," Andrada said.